Verken de onderwaterwereld voor de kust van Bermuda terwijl je een Hartley-duikhelm draagt. Tijdens deze 3,5-uur durende eco-tour doe je de gespecialiseerde helm aan en klim je de ladder af van de volledig uitgeruste boot met glazen bodem en loop je gewoon rond op de oceaanbodem. Geniet van deze ongewone onderwateractiviteit, wat gemakkelijker is dan snorkelen of duiken en meer interactief. Breng 30-40 minuten door op de zanderige bodem van de zee en bekijk de levendig gekleurde koraalriffen van dichtbij. Het gebruik van alle apparatuur, inclusief natte pakken, is inbegrepen. Hotel ophalen en wegbrengen niet inbegrepen. This was a fun excursion, unlike anything offered in most places. We enjoyed the time on the boat and the exploration underwater was fantastic. Greg did a great job of erasing any fears we had about the helmets and being underwater. Photos of the experience were offered at a very low price. 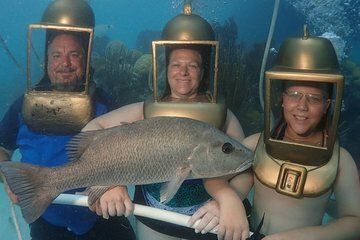 Both my wife and I have done hours of scuba diving but this was truly a unique experience! I knew Gregg's brother who runs similar excursion in the Bahamas where we life very well so there was an immediate bond. To be able to touch the fish and watch them do tricks swimming through a hoop must have taken hours and lots of food rewards! Photos and videos provided many happy memories of a thoroughly enjoyable trip with a fun group of people who had never been underwater in this environment before. Would certainly highly recommend, thanks for everything Gregg!! Loved the experience, highly recommend it. The captain and first mate were informative and very entertaining, a one of a kind experience you wouldn’t want to miss! Well worth the price! Conveniently located at the end of the dock of Rotal Naval Dockyard. Greg and Ben were fun. Bring your Go Pro, and they'll maneuver your device to get the right shot! Photo package was reasonably priced, too. It was everything they said it would be! Great trip. Camera could have been better centered for the three of us. Encouraged to jump but then helmet weight made me fall backwards. Helmet came off and I surfaced on my own and swam to boat. It was an amazing tour. You walk under water on a reef with a special helmet over your head, with fresh air constantly pumped into it so you can breathe normally. The tour operator took pictures of us with fish in front of us. You can touch some of the fish. The tour operator feed the fish daily so they are used to people touching them. Beware that there is an additional charge for the pictures. Since the fish were trained by the operator, your experience is not really natural. Because of this, I was tempted to give this tour 4 stars instead of 5, but decided to give 5 stars anyway because I was really amazed. They trained these fish better than I trained my dog. This was amazing! Highly recommended. Greg was so knowledgeable and I had a blast. If I could do this, anyone can. I'm very neurotic and thought it would be scary and claustrophobic. There were honey oat bars, water, and fruit juice. You can buy the pictures and video on the tour. It was fantastic!!! I highly recommend this tour. We were looking for something different to do in Bermuda and this was it. The owner, Gregg Hartley, began our excursion by giving a brief history of the company and of helmet diving. Next he explained what we would be doing and how it works. He also gave an overview of what we would see and do. Gregg has a delightful personality in which he combines information and humor. He reassures anyone who might have a little trepidation about doing this. Once in the water with our helmets, we all held onto a white tube that kept us connected. Gregg could also lead and direct us using this. He led us to a spot between 2 coral reefs with lots of fish. He has trained fish to do tricks for food. They will come right up to you and even let you pet them. Your whole experience is photographed and recorded so you have a record of this amazing experience. We would highly recommend this excursion to anyone. It was fantastic!